This is my last post about the Calamus Reservoir carp die-off, I promise. If you have not heard about this, you can go back and read the previous blog posts, https://barbsandbacklashes.wordpress.com/2010/08/26/calamus-carp-die-off/ and https://barbsandbacklashes.wordpress.com/2010/09/03/calamus-carp-die-off-update/ . The only thing I really have to add now is an estimate of the numbers of dead carp. Now keep in mind that this estimate is based on the number of carp carcasses found along certain lengths of shoreline and probably is a conservative estimate. 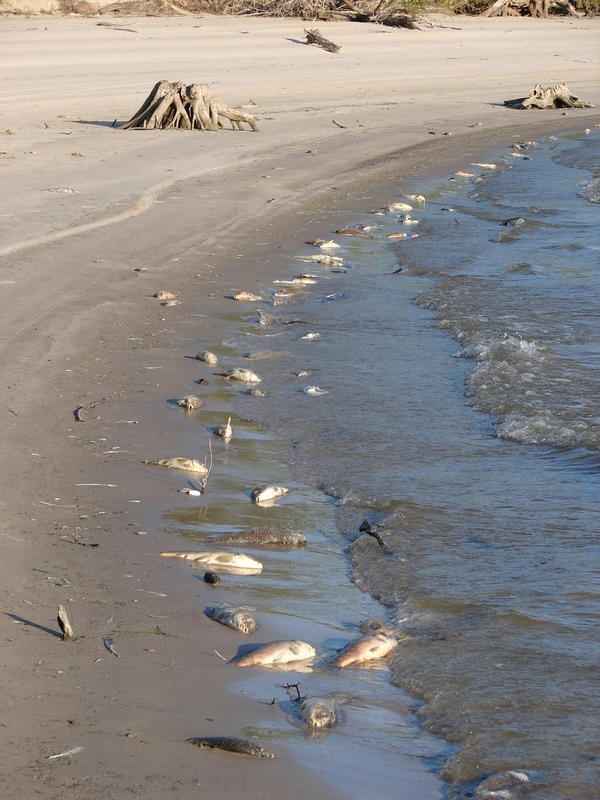 Anywho, we estimate 200,000 carp died at Calamus in the past few weeks. By far most of the carp that succumbed were 15-20 inches long; there were a few smaller carp that perished and a few larger carp, but it appears that most of the carp were about the same size and probably members of the same year-class. It should also be noted that this was NOT a complete kill by any means (there are likely carp in the population that carry the koi herpes virus, but do not get sick nor exhibit any symptoms). It appears that there are plenty of larger carp that survived. I am sure there is going to continue to be an odor around Calamus Reservoir until all of the carcasses decay and are recycled back into the system. Other than that there is no other problem with the water quality nor the health of other fish at Calamus. There are still plenty of fish to catch at Calamus, even carp if that is what you want to pursue.